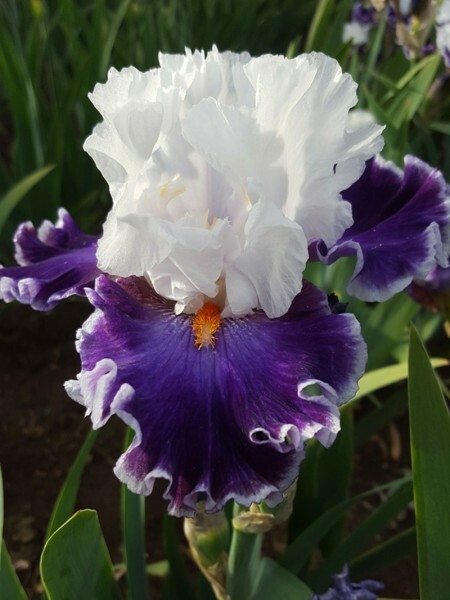 Iris Stats for: "Merry Amigo"
Hybridizer's Comment: Striking in its contrast and an example of a true amoena with pure white standards with no other colour; falls are rich red violet and with a well defined 1/8" white edge, so precise. Beards are bright tangerine orange. Nice sculptured ruffling on the petals. Show branching. 50 or more years ago we grew a variety called 'Wabash'. This is a very modern updated version of that old favourite. Fertile but not easy.